Turkey’s foreign policy seems to be an entangled net of foreign relations. A NATO member and U.S. ally in the region, Ankara has grown distant toward Washington D.C. due to the American support for the Kurdish militias involved in the Syrian conflict. Once a major Russian tourist attraction, Turkey now faces an economic boycott after downing a Russian jet last year. The eternal EU candidate, Ankara was accused to be playing the refugees card in order to negotiate better deals with the EU (including the visa waivers and an assistance package). We have asked Mehmet Fatih Öztarsu, a Turkish political analyst, some questions about Turkey’s complicated foreign policy. IRR: Francois Hollande recently declared that “There is a risk of war between Turkey and Russia”. How serious is this risk and what would it entail for the NATO-Russia relation? Mehmet Fatih Öztarsu: It would be said that there is a risk of war between NATO and Russia as a proxy type in a conflicted region. It is not an easy thing to talk about a war among modern countries. If Hollande declares this, he should explain the details of his expectation. According to Russia, a new Cold War starts between Russia and West. Even Russian officials don’t talk about a war with Turkey, some of the European leaders would like to stand far from this conflict by sharing Turkish position under question. IRR: Turkey used to be one of the most reliable NATO allies in the region, in the 2000s having committed over 2% of its GDP for defense matters. Do you think NATO would stand by Turkey in the event of a Turkish-Russian war? Mehmet Fatih Öztarsu: As I said before, nor Ankara neither Moscow expect a war. There is a political conflict which is totally about the Syrian issue. Yes, if there is a violation in southern borders of Turkey, we should think about NATO intervention. But Russia is a serious country which is aware of Realpolitik. IRR: After shooting a Russian SU-24 bomber last year, Turkey was subdued to an economic boycott by Russia. How much is Turkey’s economy affected and to what extent is the ruling Justice and Development Party (AKP) trying to overcome the impact? Mehmet Fatih Öztarsu: It seems that Russia is under a worse situation than Turkey. Maybe Turkish tourism would be negatively affected by this situation but agriculture and other areas are different. If we look on the energy side, yes there may be a big problem since Turkey mostly depends on Russian gas. AK Party is ready to create alternatives such as the Caspian corridor to reach Central Asia and some Black Sea routes to avoid Russian sanctions. IRR: Recently, President Recep Tayyip Erdoğan has accused the US of arming YPG Kurdish rebels. Ankara went as far as to condemn YPG for the February 17 terrorist attack, even though the attack was claimed by another Kurdish group. How much does the Kurdish issue affect Turkey’s international behavior and especially its relation with the US? Mehmet Fatih Öztarsu: If we change the names, ISIL could be divided into different pieces and the world community could call these small groups as non-ISIL actors. It is not logical. All Kurdish-based terrorist groups are parts of a unique organization. PKK is responsible for Anatolia, YPG and PYD are working in Iraq and Syria. Nowadays some small groups are declaring themselves as metropol workers. We should be aware of this advertisement game. IRR: Counterfactual: Turkey bordering Kurdistan. How would this remodel Turkish politics and regional interactions? Mehmet Fatih Öztarsu: First of all, Turkey is bordering with independent Iraq. There is no any term such as Kurdistan. It may be called as Iraqi Kurdistan. Turkey shares great respect to the territorial integrity of all neighbors. Thus expects the same attitude to itself. Turkey’s first agenda is to terminate regional terrorism and chaos. IRR: What role does religion play on Turkish foreign policy and its positioning in the Syrian crisis and the Middle East? Mehmet Fatih Öztarsu: Religion is not driving Turkish foreign policy. There are several balances in this way. If we talk about the religion effect, it could be only for other Muslim people in our neighborhood. The security of Christians, Yezidis, and other religious groups are also very important for Turkey. 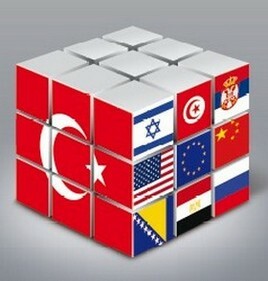 We can share numerous Turkish state investments for non-Muslim locations in different countries. IRR: Turkey is already hosting close to 2 million Syrian refugees and it struck a €3 billion refugee assistance deal with the EU. What are your thoughts on Ankara’s strategic reasons for helping the EU with the refugee crisis? Mehmet Fatih Öztarsu: First of all, Turkey accepted these people only for a humanitarian case. Since 2011, Turkey accepted over 2 million refugees. In that time, Turkey didn’t expect any help from EU or other actors. Today EU wants to stop the refugee movement towards European borders and shares a carrot stick to Turkey. €3 billion is not an important amount for Turkey. But if the EU wants to help Turkey, there should be other significant ways as president Erdogan declares. IRR: Turkey has been a candidate country to the EU since December 1999. Is the EU accession still a foreign policy objective for Ankara? How about for the Turkish people? Mehmet Fatih Öztarsu: EU is an important subject for Turkish foreign policy. A ministry was founded on this case. Turkey shared serious approaches since the first day of its process. Turkish people are also supporting EU process but Ankara waits although it implemented all reforms. IRR: Last year, Ankara was hosting the G20 summit. This year discussions revolve around an isolated Turkey. What are Turkey’s major strategic errors that led to this situation and how could it overcome its international seclusion? Mehmet Fatih Öztarsu: The thought of “an isolated Turkey” has been declared by some leaders only and we saw who was against the Turkish position in the region after this meeting. Turkey is naturally under a difficult situation and no countries care about this reality. The country has faced several terror attacks in Istanbul, Ankara, and other cities, it hosts over 2 million refugees and Turkish officials want to force against terror activities to finish these process. The “Who is who” reality stands there and Ankara expects international will to combat terrorism and to provide a steady authority in Syria.